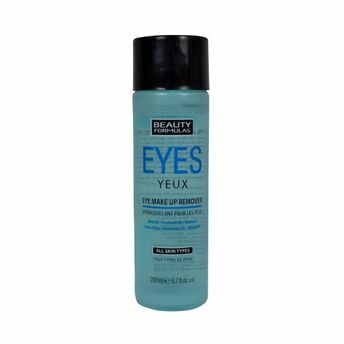 Remove that stubborn eye make up with ease with the Beauty Formulas Eye Makeup Remover. It is effectively formulated to remove all the traces of eye make up and to hydrate the delicate area around the eye. It is mild and non-greasy pH balanced formula with Pathenol that soothes, tones and moisturizes your skin, while removing the make-up. Additional Information: Beauty Formulas is a UK-based brand that offers you skin care and lifestyle products. Their formulas are skin friendly and work deeply in your skin to offer the desired results. The brand offers an attractive and comprehensive range of quality products, which includes cleansers, scrub, face pack, shower gels, body wash, conditioners, foot care, hand and body and oral care. Right from problem specific to general product, this brand provides you products that help you enhance your appearance. Explore the entire range of Eye Makeup Remover available on Nykaa. Shop more Beauty Formulas products here.You can browse through the complete world of Beauty Formulas Eye Makeup Remover .